Low Maintenance: With an AZEK composite deck, you will only have to worry about giving it an occasional light cleaning every now and then. With summer slowly rolling in, now is the perfect time for homeowners in Ellicott City to add a beautiful AZEK composite deck to their pristine homes. Maryland is known for its unpredictable weather, so it’s important to add a deck that not only looks good but also offers durability and reliability. Below, you will find out why composite decks are becoming so popular in Ellicott City. While wooden decks offer a typical lifespan of 10-15 years, composite decks are known for their durability and longevity. One of the big reasons for this is that AZEK composite decks are not vulnerable to the type of issues that accompany wooden decks. It can hold up against the toughest weather conditions, isn’t susceptible to mold and mildew and will still be looking good at the same time wooden decks start to rot. If you’re like most homeowners, you would rather relax on your deck than spend all your time cleaning it, treating it and staining it. Wooden decks are very attractive, but most people don’t want to deal with the annual maintenance of cleaning, sanding and staining. With an AZEK composite deck, you will only have to worry about giving it an occasional light cleaning every now and then. You won’t have to invest in expensive staining and treatment options or pay for the labor to stain or treat your deck. Ellicott City homes are some of the most beautiful and pristine in all of Maryland, so it stands to reason that most homeowners expect a solid return on investment with any additions they make to their property. New homebuyers will be attracted to the low maintenance costs of your deck, and this is a prized selling point. With 40 years of experience behind us, Freedom Fence and Home provides the highest quality deck installation in the Ellicott City area and beyond. We are licensed and insured in the state of Maryland and our record of zero complaints with the Maryland Home improvement commission and the Better Business Bureau speaks for itself. Our experts are available to help homeowners and business owners, like you, select the right materials for your new deck project. 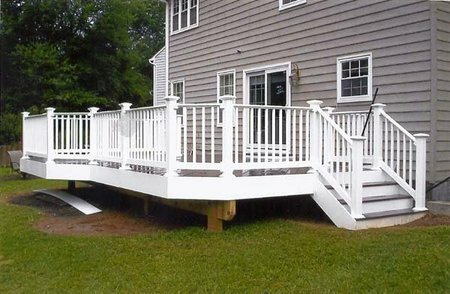 If you have any questions about Composite Decking, please contact Freedom Fence and Home by calling 443-271-6841 or visit our website. You can also follow us on Facebook and Twitter! This entry was posted on Friday, May 29th, 2015	at 2:29 pm	. Both comments and pings are currently closed.